The weekly photo challenge offers a seemingly common theme Liquid. What we as photographers do with it remains to be seen. My favorite leisure spaces are all about water, but today I wanted to give you a new way of looking at this most important element of life. While on a blogging break I posted this photo on Instagram of a tiny droplet of water hanging from a rosebush. What do you see inside the droplet? 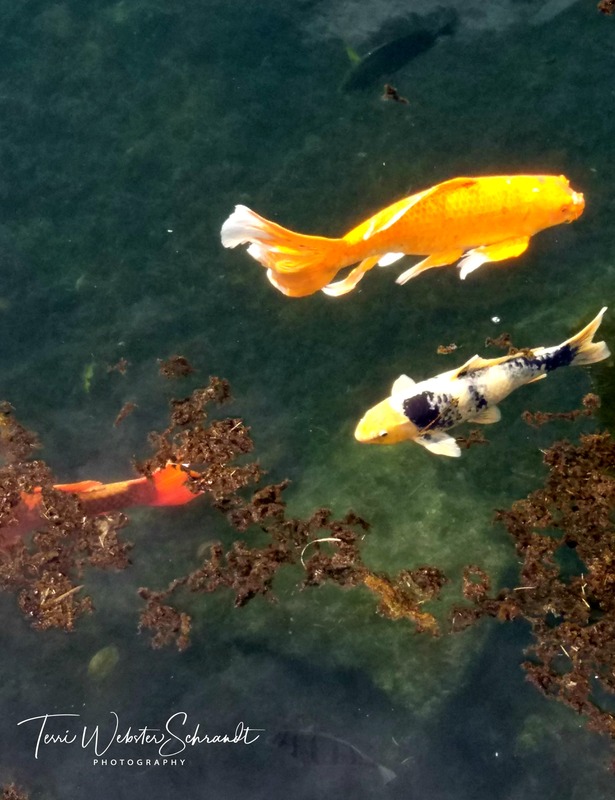 In this next image, taken from an open window in the Ponds Hilo restaurant (famous for their koi ponds), I saw the koi swimming just below us. I’m sure they were waiting for random food crumbs to fall, as they slowly circled around. Illuminated from above and below, they appear to be floating in an ethereal liquid rather than ordinary pond water. Hard to tell where the air ends and the water begins. What do I see in that drop? Now that would be telling, Terri, but you can guess that it’s probably going to be something dark that comes with a twist. 😈However, it’s a stunning piece of photography. Catching up on my blogs for a few minutes this afternoon. That drop of water is amazing! I see an entire world in that drop! And the fish photo is also incredible. Thank you, Deb! I think half of photography is luck! Terri, I see you, and the front wall of your house!! So unique! OMG This drop of water is absolutely breathtaking! A whole world inside this little drop of water!!! Thanks, Liesbet. I was amazed to capture both of these images! The reflections in the drop of water are incredible, Terri. Thanks, Robbie. I’m not always sure how they turn out until I see them on my computer. I was really pleased with this one! Oh how cool, Tina, and thank you! Exquisite ! I particularly like the first drop of water. It IS fun to study the water drop. Nice capture. the fish? It dow look like the two on top are floating in air. This was a fun theme to think about. 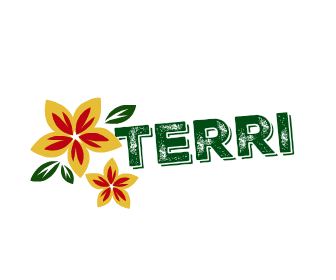 Have a nice weekend Terri. Wow! 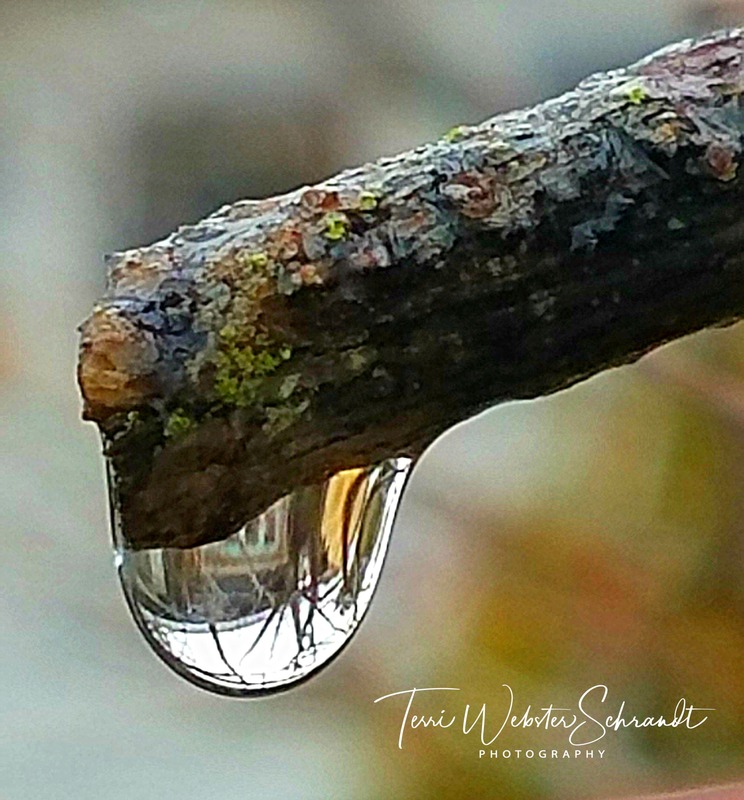 That image on the droplet of water that you photographed is truly amazing, Terri. You are an outstanding photographer! Thank you, Donna! Can you believe that was with my phone? Wow! That makes your photo even more incredible! Fascinating images. When looked at just so fish seem to be flying in water. Even better when you’re in there with them. Thanks, Carol! Enjoy yours, too! The photo of the water droplet is exquisite. I see tress and a building! Thank you, Michele! The reflection is my front window of my house. Crazy huh? Catching that drop is beautiful, Terri! !